A couple of years ago, my new Blackberry Storm was one of the best smartphones on the market. (Obviously this was pre-iPhone.) Its cool features and Verizon’s buy-one-get-one-free deal hooked my husband and me into buying a pair. I’ve rued the day many times since then. 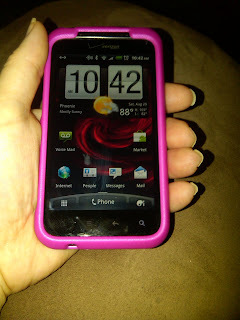 My commitment to the Blackberry and to Verizon expired last April. I continued to complain; I had no excuse for not upgrading except that the pain of switching would be worse than the pain of keeping what I had. Kind of like living with a broken leg because you don’t want the doc to set it. This week I found my courage and set my broken leg with a new Droid Incredible 2. It was smart, it was free with a 2-year commitment, and it had great reviews. I knew it wouldn’t have Word Mole but figured I could keep the Blackberry charged up for the game. Turning it on is a 2-step process, and that’s one step too many. Why do I have to push a button AND swipe the screen? The Facebook interface stinks. I can’t see at a glance whether I have new notifications in Facebook. That’s a separate, five-step process. Swipe, swipe, touch, swipe, touch. I can’t get email set up. After four days, I’m still trying to get the IMAP settings from our domain admin. Paul, call me! Making anything larger takes two fingers and a special pulling-apart motion instead of one finger pressing the screen. It doesn’t have Word Mole. That means I’m stuck carrying around two phones until I can download an equally addictive, challenging, fun time waster on the Droid. Yeah, I know—new technology can be hard to adopt when you’re so in tune with the old (the enemy you know intimately can be a more comfortable companion than a new friend). Give me another week or two, and I’ll eventually find a few things I like about my Droid. It doesn’t constantly reboot itself. It can automatically switch to speaker mode when you flip it over. The clock display is so big I’m sure the astronauts can read it from the space station. Its touch screen doesn’t make any noise, so when I do eventually find another game, I can play it in stealth mode all night long. Do you think I could bribe the Droid programmers to make an Incredible version of Word Mole?